After a month’s hiatus due to school work, I can now finally attend to my blog. And what better way to make up for it than a post on my favorites! With over 50 cities in 15 European countries on my list so far, I find it extremely hard to pick a favorite. For the most part, each one offers a unique experience that is almost impossible to compare with the rest. But by writing about travels, I know this is bound to happen at a certain point so as difficult as it may seem, I tried to select a top five. Of course, this is just my personal evaluation and since I haven’t visited all European cities (mostly in the east for proximity reasons), this is bound to change in the future. Andalucian sun may burn your skin but Spanish passion can ignite your soul. From bullfighting to flamengco, tapas, and the contagious smiles of fiesta-loving Spaniards, nothing represents everything you know and love about Spain than Andalucia and its capital Seville. Upon my first glance of brick-laden (artistically stacked to renaissance perfection) Plaza de España, I already knew this was going to be my favorite city. In fact, the city is so beautiful some of your beloved GoT scenes are shot in its world famous monuments such as the Alcazar Courtyards and the Plaza de Toros. The Giralda overlooking the Seville Cathedral also boasts one of, if not the world’s biggest gothic cathedral. Relatively cheap for a city of its grandeur, fun and nice happy people, expansive green spaces and Moorish-Rennaisance blend of architectural inspiration on every corner, it’s hard not to enjoy this extraordinary city in the south of Spain. 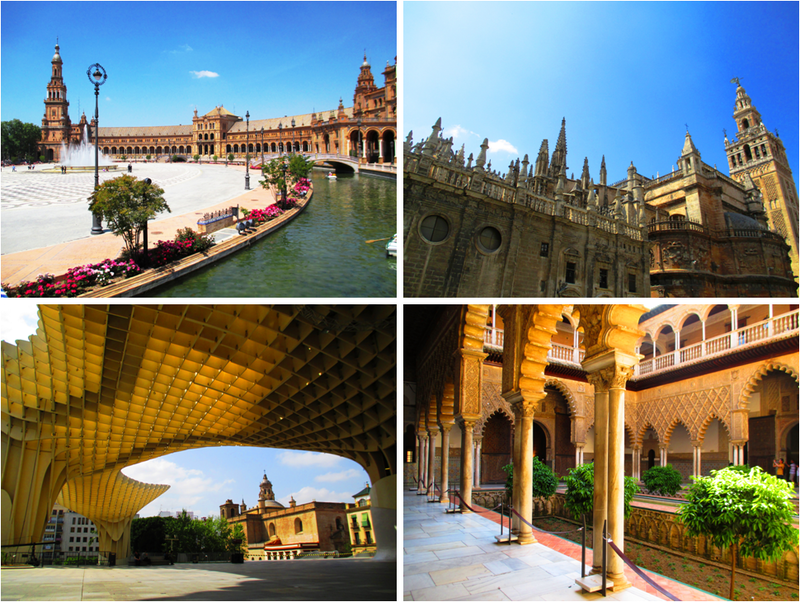 Clockwise from Top Left: Plaza de Espana, The Giralda and The Seville Cathedral, a part of the Alcazar Gardens, and the Metropol Parasol. I considered this city a home away from home for almost a year, enough to make me so terribly homesick about it. 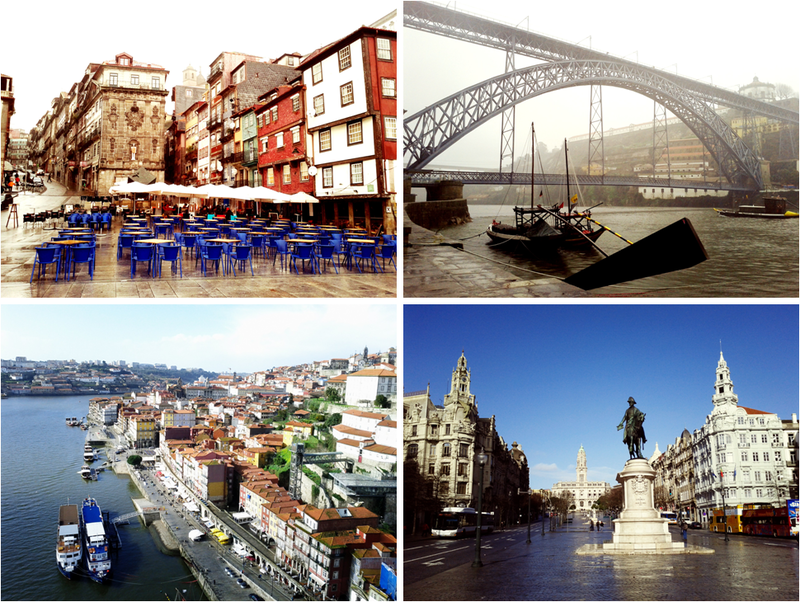 Porto is just the best city to live in. Things are quite cheap, transportation is modern, people are hospitable and welcoming, the Atlantic and its surf-able waves are a short ride away as well as the photogenic vineyards, cellars keeping some of the world’s best wines and an old city with an unparalleled collection of old streets, houses, and monuments… Please stop me before I weep while recalling all the good memories I had in this city! Also, as a city flocked with students from all over Europe and mostly Brazil, there is no dull night in Porto. There’s no doubt why all the up-and-coming destinations in Europe conceded to it for the Europe’s best destination of 2014 label. This city deserved every accolade; I could not oversell this further. Well, I don’t really have to – the wonder of the city can speak for itself. Clockwise from Top Left: Riverside restaurants along the Ribeira, the Ponte D. Luis steel bridge traversing the Douro River, Aliados Main Square, and a view of the Douro and Ribeira from the steel bridge. Also another underrated city, Budapest is a place to behold. Just for the splendor of its Parliament Building dominating the banks of the Danube, this city is well worth the visit. Being still a little rough than its tourism-specialized counterparts, the city has effortlessly managed to preserve its culture and vibe. And for an Asian who craves for savory food in this side of Europe, Budapest is far from culinary disappointment. The vibrance of its central market selling ropes of paprika beside stalls selling exaggeratedly topped langos and chimney cakes (with a name I cannot spell) is a feast for the eyes and the palette. The Fisherman’s bastion perched on the castle hill at the Buda bank offers an awesome view of the Pest skyline across the river. And of course, I could not further emphasize the city’s penchant for thermal baths! Who says public bathing is a thing of the past? 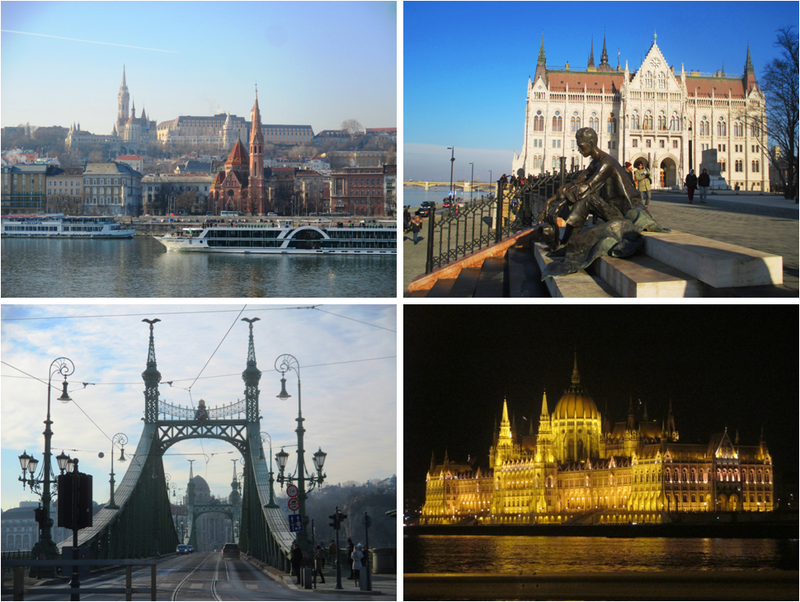 Clockwise from Top Left: View of the Buda side along the Danube riverbanks, A tribute to a Hungarian Poet near the Parliament Building, The renowned Hungarian Parliament Building illuminated at night, and the Budapest Independence Bridge. There is some truth in what has been referred to as the most beautiful city in the world. Just for the women, I am completely sold. Maybe that is the real reason why. Or the amazing superfluous cheap beer might have impaired my judgment. But no, there is no doubt that this city is one of the prettiest. The hundreds of spires that pierce the city skyline are indeed very impressive. 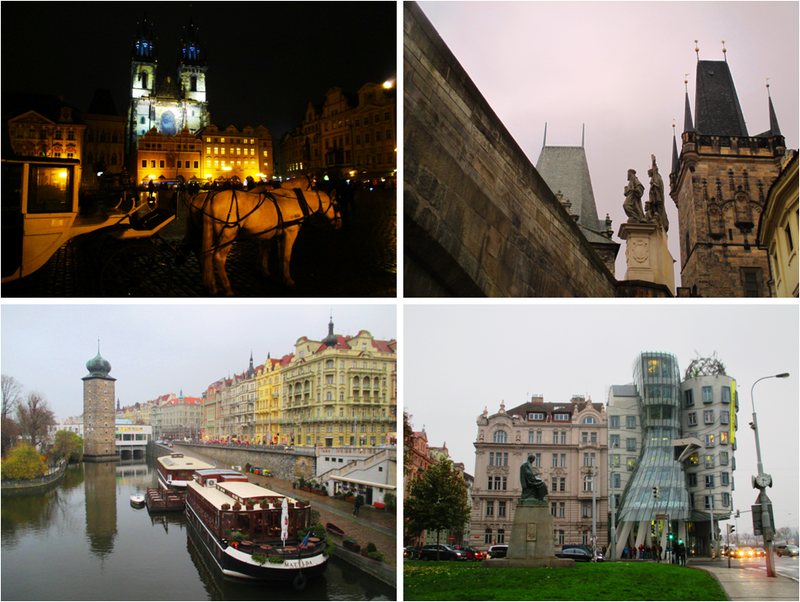 Perennial favorites like the Old Town Square, St. Vitus Cathedral, and the Charles Bridge of course lived up to their expectations. The Petrin lookout tower, a painstaking climb, leads you to a spectacular view of the entire city. Walking through the Bohemian streets is also a delight as the buildings seem to look like noteworthy monuments of their own with occasional peculiar installations here and there such as the famous Dancing House. And yes, housing the world’s heaviest drinkers, you can’t leave this city without a drink (with a super-unhealthy-but-so-sinfully-juicy-you-can’t-resist pork knuckle dish to go with it). In fact, the city becomes twice as beautiful after gulping a pint… or more! Clockwise from Top Left: Old town square at night, the Charles Bridge, the famous Dancing House, and a view of the Vltava River. Gaudi, Gaudi, Gaudi… enough said. No, let’s be fair. But yes, if Gaudi does not amaze you I don’t know what will. Decked with Antoni Gaudi’s work and inspiration, the city is a quirky refreshing break from the typical European feel. No wonder that since it is surrounded by lush hills offering amazing perspectives of the city with the azure Mediterranean coast on the backdrop, Barcelona has inspired artists like Joan Miro and Salvador Dali with its charm. There is also something about this orange-y hue, I am sure there is a technical term for this pantone monochrome that is probably the characteristic color of this city but it works. Green spaces everywhere, fun-loving people, food is not very special but there are good finds especially when it comes to tapas. The ever unfinished Sagrada familia, my favorite basilica in the world, is the grandest example of biomimicry in architecture – thanks to Antoni Gaudi, I think I mentioned his name 10 times already but seriously, Barcelona will never be the same without him. 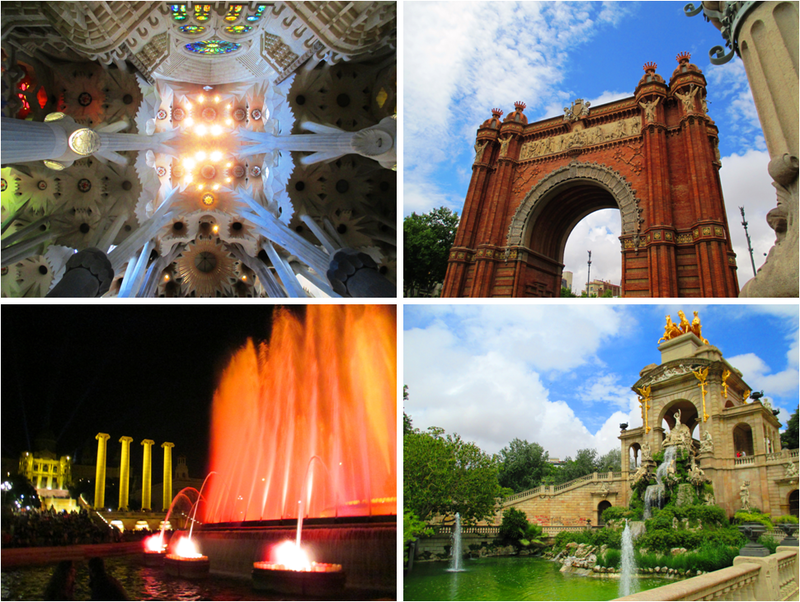 Clockwise from Top Left: Gaudi’s masterpiece at the main ceiling of the Sagrada Familia, the Arc de Triomf, the serene fountain at the Parc de la Ciutadella, and the spectacular fountain show in Monjuic.